In every Tides of War chapter of Battlefield 5, DICE always rolls out a new set of challenges that rotate every week which gives players something to aim for whenever they’re playing. 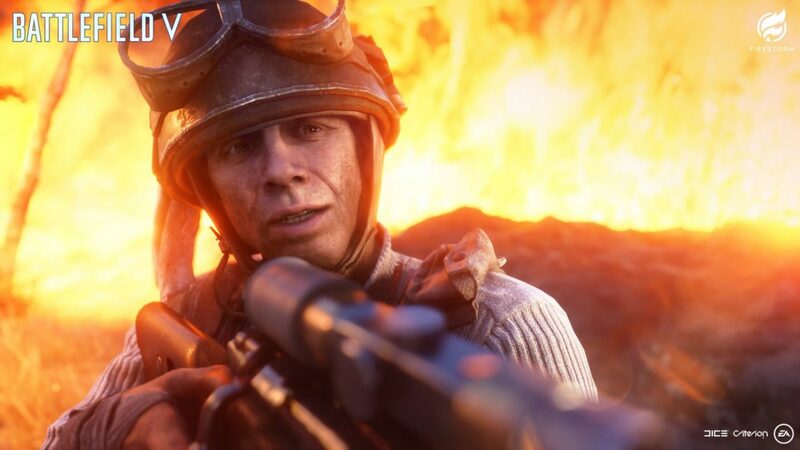 With Battlefield 5’s battle royale mode Firestorm set to hit tomorrow, it seems the Battlefield 5 Tides of War chapter 3 challenges will have a lot tied to the mode, which isn’t surprising. Unearthed via datamining the game files by Reddit user temporyal, the full list of Battlefield 5 Tides of War chapter 3 challenges can be seen below! Note that these could change at anytime, so don’t read everything you read as things that are set in stone. Welcome to Firestorm! Parachute onto the peninsula of Halvoy on your own or with up to 3 squad mates, scavenge for supplies and fight for your life. There are no second chances in Firestorm, if you bleed out or are finished off you are out of the game. Earn X score in Firestorm. Strongboxes left behind by Sulis can be found in built up areas and abandoned military bases. They contain a wide variety of supplies including weapons, gadgets and healing items. Open X strongboxes in Firestorm. As the firestorm closes in, supply points at various points of the map may become active and can be located by the rising barrage balloons. If you or your team can hold one of these points you will be rewarded with rare and epic weapons and reinforcements. Prepare to fight as other teams will also be after these rare resources. Capture X supply point in Firestorm. The wheat has been separated from the chaff, only 16 remain in the Firestorm. Can you make it to the end? Make it to the last 16 in Firestorm. There is more than one way to skin a cat. Utilize every tool at your disposal. Kill X enemies in any game mode. The Sulis organisation imported a lot of military hardware to the peninsula to protect their research. Vehicle lockups can be found at strategic locations that may contain abandoned combat vehicles and other valuable supplies. Alarms sound whilst you are opening them, alerting everyone in your vicinity of your location. Open X vehicle lockup in Firestorm. Everyone starts the game with a basic armor vest, but you will need to find armor plates to put in it before it becomes effective at absorbing damage. Rarer vests can be found that can accommodate more armor plates at the same time. Equip X Armor Plates in Firestorm. In Firestorm you can restore your health with healing syrettes. These common items heal a portion of your health over a short period of time and can also be used to heal team mates. Heal yourself or squadmates for X health. Work as a squad, complete objectives, defeat enemies, utilize your gadgets and stay alive. All of these will increase your score. Earn X score in any game mode. Victory is in sight, but be wary – everyone that remains is either very good (or very lucky). Make it to the last 8 in Firestorm. Personal armor can make the difference between winning or losing a firefight. When you break an enemies armor push your advantage before they can replace their damaged plates. Break the armor of one enemy in Firestorm. A submachine gun (SMG) is a fully automatic weapon that fires small calibre ammo allowing for more accuracy at a high rate of fire. Inflict X damage with SMGs in any game mode. Vehicles in Firestorm have limited fuel and ammo so use them wisely or find supplies to replenish them. Stockpiles of fuel and ammo can be commonly found at abandoned Sulis military camps. Kill or assist in killing X enemies while in a vehicle in Firestorm. Explosive ordinance is great at taking out vehicles but can also be used tactically to destroy buildings or flush enemies out of cover. Inflict X damage with explosives in Firestorm. A squad that fights together survives together. Concentrate your fire to take out enemies quicker. Get X Kills or Squad Kill Assists in Firestorm. Shotguns are very common and excel at close range engagements but quickly become less effective at longer ranges. Always make sure to have an alternate type of weapon equipped. Inflict X damage with shotguns in any game mode. Even though you are isolated on the ground, help is not far away if you find the right equipment. Reinforcement flares can call in vehicle and supply drops or even heavy artillery support. Deploy X Reinforcements in Firestorm. Better equipment can be found at named locations on the map, but there will be more competition. If you are after action, then these locations are the place to be. Inflict X damage in one life in any game mode. Vehicles give you great firepower and mobility, but are vulnerable to all explosives. Keep moving and be the one who shoots first. Inflict X damage using vehicles or against vehicles in any gamemode. Ingame Description: If a building catches fire, cut it down to save the neighbourhood. The same applies to enemy combatants, burning or no. Halfway there. Don’t get overconfident as the encroaching firestorm means you are more likely to run into enemies. Make it to the last 32 in Firestorm. V for Victory! Can you emerge from the Firestorm ahead of all others. Win a round of Firestorm. Capturing objectives in a vehicle might seem like a good idea but it could leave you vulnerable to an ambush. Capture X objectives or resupply points while in a vehicle. You will be rewarded for just staying alive, but more risky actions give even more score. The best defense is a good offence. Taking out the enemy before they kill you is the only way to ensure victory. Kill X enemies in one round of Firestorm. Make every bullet count – headshots are the most efficient way of taking out the enemy. Kill X enemies with headshots in one round of any game mode. If you down an enemy don’t overextend yourself trying to finish them off – their squadmates will probably be nearby. Down X enemies in Firestorm. Exploring the stockpiles of equipment left behind by Sulis is not only the best way of equipping yourself it also denies that equipment from your enemies. Open X vehicle lockups in Firestorm. Calling in an artillery strike with a Sector Artillery, V1 or JB2 rocket reinforcement can turn the tide of the battle. In Firestorm make sure your squad is not in the impact radius as the explosion doesn’t discriminate friend from foe. As a squad kill X enemies with Sector Artillery, V1 or JB2 flying bomb reinforcements in any game mode. Resupply points are the most reliable way of acquiring the rarest equipment but also the riskiest as everyone can see your capture progress. Prepare to defend your position. Capture X resupply points in Firestorm. Scavenge. Fight. Survive. Only the best will outrun the firestorm. Earn X score in one round of Firestorm. Keeping your squad on their feet is essential to your survival. All squad mates have the ability to revive each other if one has been downed by the enemy. Revive squadmates or be revived by squadmates X times in any game mode. Note: This week seems to be work in progress and therefore very fragmented and not final. In Firestorm if you are downed you are not totally out of the fight. Defend yourself with a sidearm or melee weapon until an ally can revive you. Deal X damage with melee weapons or sidearms in Firestorm while downed. Working with your squad is essential to survival in Firestorm. If an ally is downed, they can be revived and back into the fight if you get to them before they bleed out. If you are downed, you can make it easier to be revived by crawling into cover. Revive X squadmates in Firestorm. The tractor is usually used for general farming tasks, can you use it to farm kills? Get X roadkill using a tractor. With a focused combat area capturing and defending the objectives becomes a whole new challenge. Play X rounds of Grind. You miss every shot you don’t take, so keep firing. Kill X enemies from within 20 meters in one life. A well maintained squad will be able to stay in the fight longer. Keep your team supplied with bandages and ammunition with the Medic and Support classes. Stay alive and make sure others do too. Squadmates can revive each other while medics can revive all teammates. Revive X teammates in one life. Get up close and personal with these weapons. Deal X damage using sidearms, melee weapons, bayonets, or shotguns. “Close” only counts in horseshoes and hand grenades. Luckily you can carry hand grenades. Kill 2 enemies with one hand grenade. Survive to keep your teammates in the fight. Resupply teammates X times in one life. Every little bit counts. Attack, revive, resupply, and attack some more. Earn X score in Grind. Silent but deadly, use this silenced weapon to your advantage. Get X kills in one life using the Commando Carbine. A bullet for every enemy. A bandage for every comrade. Heal teammates or damage enemies for X health in Grind. Note: This week seems to be work in progress and therefore I can’t provide any descriptions for the challenges. Down, kill or Driver Assist X enemy while seated in a Kolibri synchropter in Firestorm. Earn X score in one round. Get X squad assists or kills while attacking objectives. Deal X damage using Assault primary weapons. Repair teammates vehicles for X health. Revive squadmates or be revived by squadmates X times. Get X kills or suppression assists using an LMG or MMG. Suppress or kill X enemies with the M26 Lahti-Soloranta. Kill enemies or revive teammates X times. Yep, as expected, the Battlefield 5 Trial By Fire challenges have a lot connected to Firestorm. If you’re not a fan of battle royale, you might want to give it a go since it’s free and all for BF5 owners. In other Battlefield 5 news, make sure to read up on the leaked info regarding the game’s new 5v5 mode! If you’re looking forward to Firestorm, make sure to read up on the weapons, objectives, vehicles and more all in one place!